08.07.12 The Round 4 pairings were posted online late at night. The Cape Elizabeth players awoke to find out who their challenging opponents would be. In the Denker, Brett Parker would face Kentucky champ Taylor (1950). In the Barber, Matthew Fishbein would play Gabe Katz (1922), the Vermont state champ. After breakfast, the participants sat down for their round at Noon. The Round 4 pairings were posted online late at night. The Cape Elizabeth players awoke to find out who their challenging opponents would be. In the Denker, Brett Parker would face Kentucky champ Taylor (1950). In the Barber, Matthew Fishbein would play Gabe Katz (1922), the Vermont state champ. After breakfast, the participants sat down for their round at Noon. Parker at 1620 was at a 330 rating point disadvantage. As black, Parker played a version of the Queen's Gambit Declined, but got into opening trouble. Bagley missed an opportunity to capitalize, and Parker quickly equalized the position. Parker then launched a pawn attack, and with Bagley's pieces weakly placed he was able to grind down his opponent to notch the victory over his much higher rated foe. This placed Parker's record at 2-2. Fishbein, playing the white pieces facing Katz, started with a Samisch opening that transposed into a Benoni. Fishbein capitalized on an early error to nearly trap Katz's queen. This led to a significant positional advantage and a won pawn. The other major factor in the game was time. In this G90/30 second increment time control, Katz was down to 1 minute in a complicated position that featured 3 minor pieces, a rook and 5 pawns for each player. With little time to think, Katz was forced by Fishbein into a position that would lose at least a minor piece. After a king-rook fork, Katz surrendered. This placed Fishbein at 3-1, and in a tie for 4th place. The fourth round results positioned Parker and Fishbein to face even tougher opponents in Round 5. 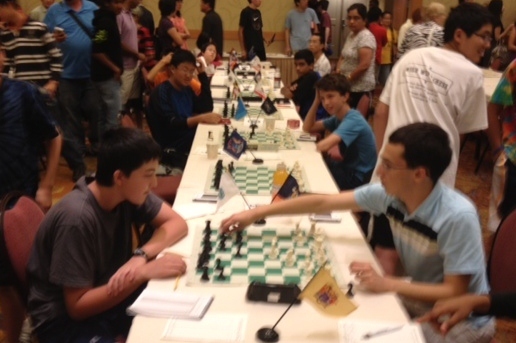 Parker was paired against Eldon Nakagawa of Hawaii, who has USCF rating of 2079. Eldon is the older brother of Ford Nakagawa, who Fishbein had faced the evening before. After a quick review with Matthew of his game with the younger Nakagawa, Brett was ready to play Eldon as white. Eldon used an interesting sacrifice tactic to gain a significant edge, and prevailed. Fishbein's Round 5 opponent was none other than "team-mate" Mika Brattain of Massachusetts. Mika and Matthew are both being coached by IM David Vigorito (as is Brett Parker's younger brother Wesley, who is also here in Vancouver.) Mika and Matthew know each other from other tournaments, so this was a match of friends. At 2237, Mika was clearly Matthew's biggest challenge of the tournament so far. The game was broadcast via the Monroi site, so both this author and Vigorito back in Massachusetts were able to follow along live. With Mika as white and Matthew playing the black pieces, the game started with a Slav opening and was even through the middlegame. Fishbein decided not to play an interesting sacrifice of a bishop for the e6 pawn that would have led to an end game of a queen and passed pawn against a rook and two knights. Brattain prevailed with superior endgame tactics to take the point. This placed Matthew at 3-2 for the tournament.